Every Tuesday lunch-time, my building hosts a work-in-progress seminar. These presentations serve as an opportunity for members of the department to learn about what their colleagues are up to in the labs. Only students and postdocs present, but group leaders are allowed to attend. For the past three years, i have somehow managed to avoid being selected… until today. I've had quite a while to prepare, but as per usual, i ended up throwing something together at 8 am this morning. Yes, i am procrastination personified. I really wasn't looking forward to it. I have no problems with standing in front of people and talking. In fact, i'd say blabbering was a natural, er – talent? No, my fears stemmed from the subject matter of said seminar: my project. I DON'T WANT TO TALK ABOUT MY PROJECT. EVER. Anyway, after spending a week being all melodramatic in my apprehensions, i finally decided to just get over it. So what if i have nothing very interesting to say? Play it cool, girl. Make the talk as light-hearted and short as possible, throw in a little comedy, and the folks will be happy. This isn't the keynote lecture at the Annual Endocrine Society Meeting; it's lunchtime at the…… place where i work [which shall not be mentioned to avoid stalkerage]. Ahem. 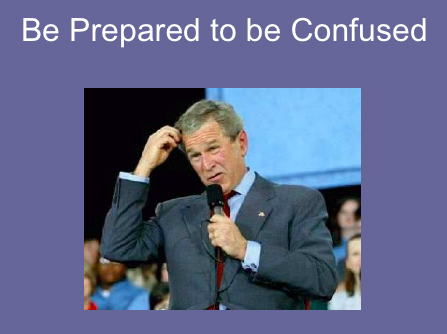 And what's the funniest thing one could throw in during a PowerPoint presentation, to wean a chuckle out of your peers? A photo of George Dubya looking like an idiot, of course! It was only fair that i serve a warning of the complexity of the story that i was about to relate (and when it comes to presenting, one can never go wrong with a GWB p-take!). So, twenty short minutes later, it was all over. I had some interesting questions from the audience, and positive feedback on my presentation style, māshā’Allāh. Thank Allāh, that none of the Profs turned up… they're always the ones throwing evil questions at people. Now, if i can only figure out a way to include George Bush mockery into my thesis, there might just be some light left at the end of this long, dark tunnel of a project!